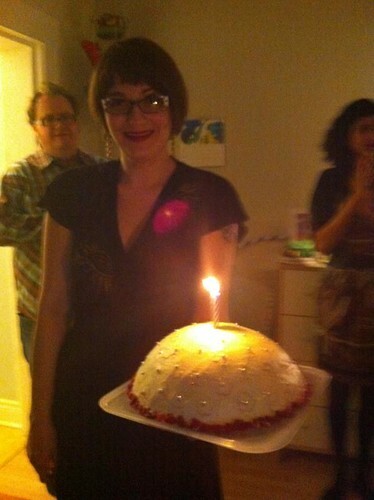 I like hosting cocktail parties but I hadn't had one for a few years. I decided to throw one around the time of my birthday because February is such a dull, dreary, miserable month in Ontario. 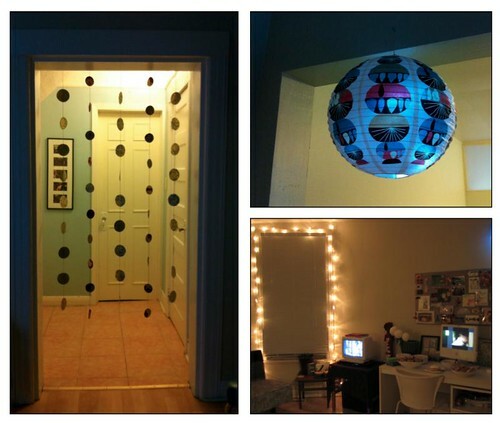 Here is everything I planned and prepared for the party. 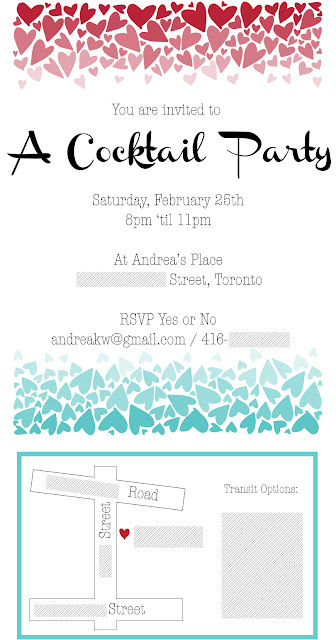 I searched online for a party invitation template that I liked. There was nothing appealing. However, there are millions of wedding invitation templates to be found so I used this customizable invitation template to make the hearts in the colours I chose, red and turquoise. This chevron template is cute, too. 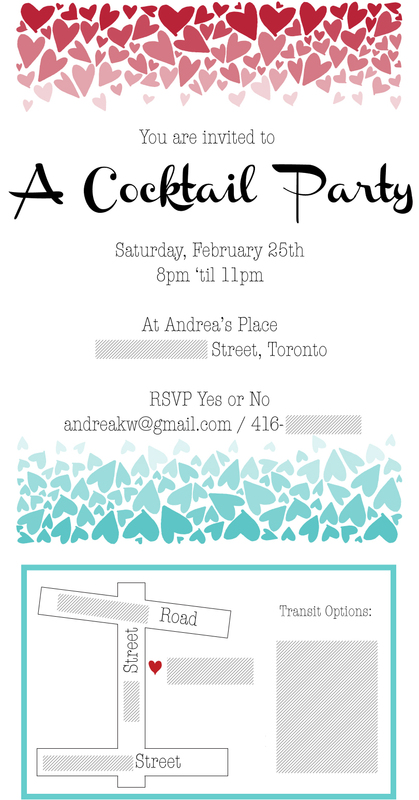 Then, because the text was far too small on the generated invitation image, I used DaFont.com to add some bolder lettering in a suitable style. This font is called Channel and I thought it had a fitting look. I added the rest of the type in Illustrator and I drew a simple map to my apartment, too. On the topic of inviting people, I simply could not ask everyone I would have liked to have at the event because I live in a one bedroom apartment. I can only fit so many guests in here. In the weeks before the party, I added to a list of cocktails I like, cocktails my guests requested, cocktails that could be made with the liquor I already had, cocktails that are crowd pleasers and so on. 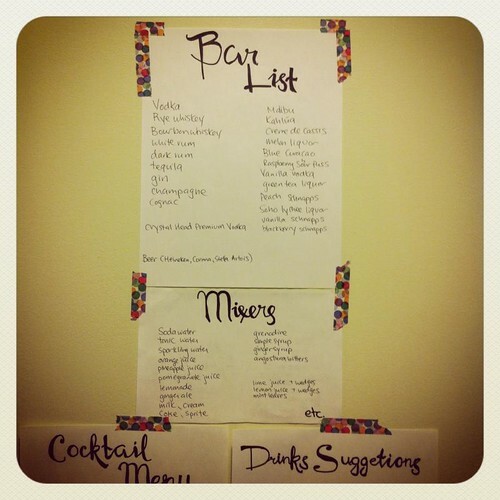 This list then generated three other lists: alcohol to buy, mixers to buy and garnishes to prepare. I made a list of all the available ingredients and posted that on the wall along with some drink suggestions (whiskey sours are my house specialty). I also got a cocktail book and marked all the drinks that could be made with what I had on hand. Days before the party, I made a fresh batch of simple syrup. Minutes before, I bought bagged ice and made citrus twists. As a single person, I only own a few glasses and plates, nowhere near enough for a crowd. I didn't want to do the plastic cup and paper plate thing so I rented glassware and plates. It costs $4 to rent a dozen martini glasses or a dozen dessert plates and I didn't even have to wash them afterwards. It's perfect. 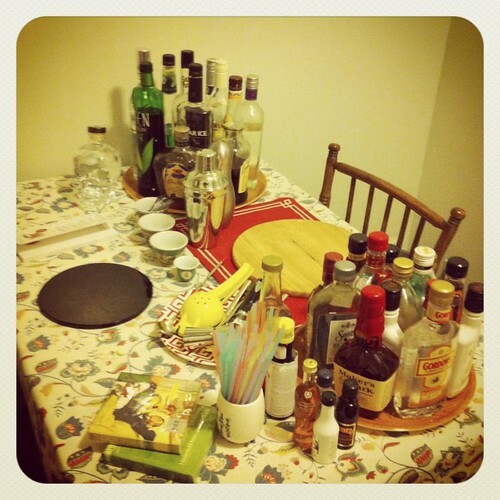 The bar itself was set up on my kitchen table. 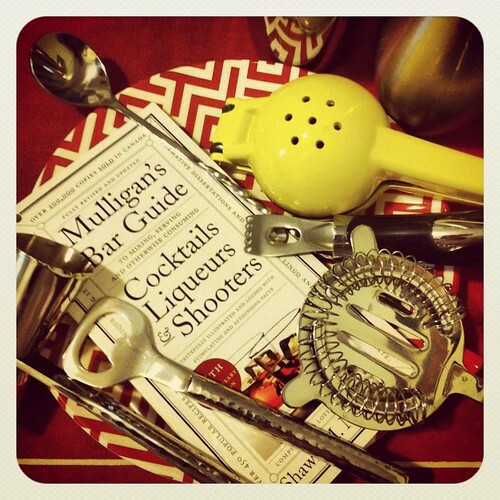 I laid out all the tools a bartender needs: shakers, jiggers, squeezers, bar spoons and more. The mixers stayed cool in the fridge and I replenished ice frequently as the night wore on. Initially, I started off mixing all the cocktails to order but my guests soon got their confidence up and they got into mixing their own from the suggestions and later, inventing their own drinks. The weekend before, my mum helped me to prepare some hot appetizers and she sent me home with several spread-type snacks. I added a few things like cocktail meatballs and Vietnamese tofu rolls from Nguyen Huong on Spadina. Not everyone has a dear friend who studied pastry at the Cordon Bleu Paris, but I do, so that's how I ended up being presented with this Chambord dome cake. Amazing! I'm continually inspired by the style of Wong Kar-Wai's films 'In The Mood For Love' and '2046'. In fact, '2046' is my favourite film and I sought out one of its landmarks a year ago in Hong Kong. Although I could not turn my apartment into a 1960s HK lounge, I added a few details. I hung some paper lanterns and paper garlands. I also had those two films ('In The Mood For Love' and '2046') playing muted with subtitles on my computer and my TV which intrigued several of my guests. 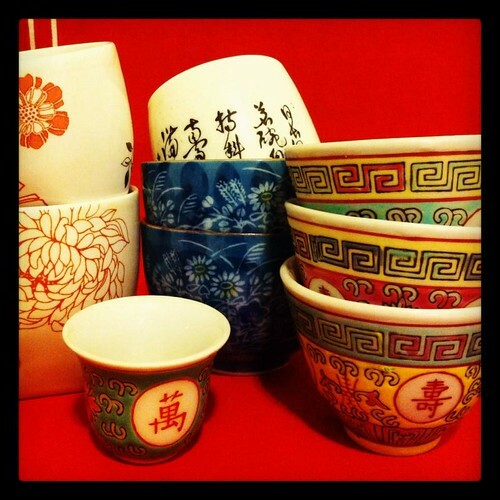 For the bar set-up, I used my various Chinese and Japanese tea cups to hold the garnishes. For a 60s cocktail party playlist, I started with key songs from the soundtracks of those same two films and went from there. This meant there was lots of Spanish Nat "King" Cole ("Quizas, Quizas, Quizas", "Perfidia", "Aquellos Ojos Verdes" and the fabulous "Aqui Se Habla En Amor") and also "Siboney" by Connie Francis. I added a generous number of Blossom Dearie songs, bossa nova by Jobim and Les Baxter, jazz from Wes Montgomery, Miles Davis and a random Egyptian combo. In the end, the conversation overpowered my carefully arranged playlist but that's quite okay. 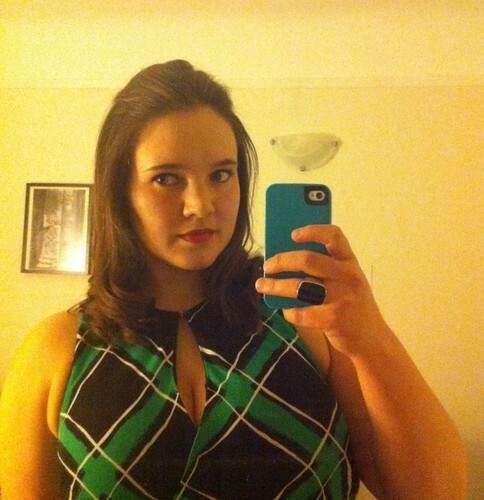 I wore a keyhole dress in a 60s-ish green and black pattern (Maple 'Across The Land' dress from Anthropologie via eBay). Wish I had a decent photo of it. I got my hair done up at a cheap salon in Korea Town. Also, I layered on the black cat eye liner but it didn't show up very well. Oh, and a cocktail ring, naturally. I think it was a good party! I was rushing around like mad but I still had fun. There was loads of positive feedback from my friends afterwards about the bar spread, the snacks, my apartment and so on. I did get generous help from my mother and my friend with respect to the food, my brother contributed to the bar supplies and my dad provided advice/arm power at the liquor store but otherwise, I planned and executed everything on my own. I have to admit that I'm proud of myself for bringing it all together. Looks like it was a great evening! You are so organized and so original. Love that it was a "family affair" of sorts. 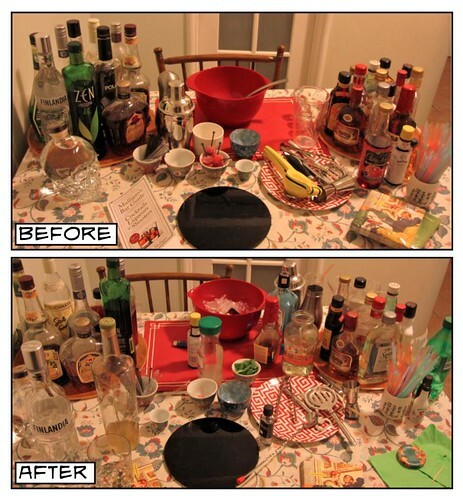 My fav part of the blog was the before and after shot. Evidence of a successful evening! That looks like so much fun! I love your hair up 60s style. OH! This looks like sooo much fun! You were so thoughtful with everything! I love the bar guide w/ the tools. So clever to leave drink suggestions up too! I thought "2046" as soon as I scrolled through the images, before I'd even read the post! It looks like an awesome party. On a totally geeky typographer's note, Channel was designed in 2011, so is totally inauthentic... looks great though ;).